By Simon Chadwick, Paul Widdop and Dan Parnell – originally published here. Jack Ma and Alibaba have forged global connections in sport. Simon Chadwick, Paul Widdop, and Daniel Parnell join the dots on a worldwide sports empire. Ali Baba is a character from the folk tale Ali Baba and the Forty Thieves, a woodcutter who gains entry to a den of treasure using the phrase ‘open sesame’. As the tale’s title suggests, the treasure is ill-gotten, accumulated by a gang of thieves who try to kill Ali when he finds it. A willing servant strikes first though, killing the thieves and saving Ali, who then unites her in marriage with his son. What this tale might tell us about sport in the 21st century is probably best left unexplored at this point. However, a door to the treasures of the 21st century has just opened-up for e-commerce giant Alibaba. In a deal announced at the World Economic Forum in Davos, the company was revealed as a new sponsor of the next six Olympic Games, as part of International Olympic Committee’s (IOC) global The Olympic Partner (TOP) program. As part of the deal, Alibaba will provide the IOC’s official cloud services, be its e-commerce platform services partner, and contribute to the IOC’s digital TV service aimed at young sports fans. Whether or not company founder Jack Ma uttered the words ‘open sesame’ before meeting IOC president Thomas Bach to finalise the sponsorship remains to be seen. However, the deal marks a meteoric rise for a company that was only formed in 1999, yet which also recently signed a deal with football world governing body FIFA to sponsor the Club World Cup (via its Ali E-Auto internet car brand). For an ambitious corporation, particularly one with global intent, such deals can be seen as part and parcel of its marketing communications activities and more general strategic development. However, unlike some other Chinese businesses, for example Wanda, sport did not play such a prominent role in Alibaba’s early development. Even so, alongside its sponsorships, the corporation set-up a sport division in late 2015, and it remains a shareholder in the Chinese Super League club Guangzhou Evergrande. In the same way as other Chinese companies, like Fosun, are locked into a guanxi network of connections and relationships, Alibaba too is in the same position. Indeed, by virtue of its new IOC deal, ‘open sesame’ does in fact seem to be an appropriate phrase given the access to people, properties, and places that it provides. On this basis, we ran a social network analysis in the same way we have previously, which revealed the following. Unlike its Chinese industrial rival Wanda, which appears to view sport as an entertainment commodity, Alibaba seems to be more focused on both its sports network and on next generation developments such as e-sports. The company’s recent deal with the IOC has opened up a whole new network of prospective relationships, which arguably warrants a further network visualisation at some point in the future. 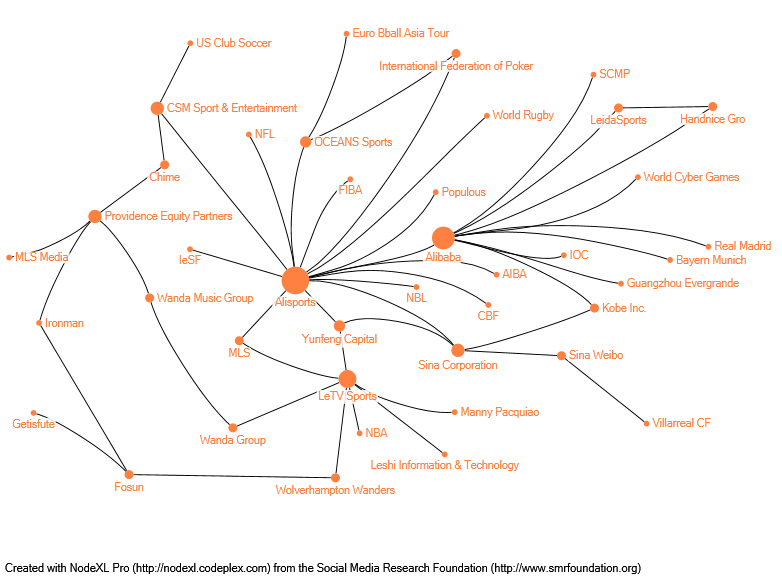 Even so, there is still plenty of interest in Alibaba’s existing network, ranging from its obvious relationship with Ali Sports, through to its links with Sina and Le Sports. Over towards the right of the visualisation, Guangzhou Evergrande appears alongside Real Madrid and Bayern Munich. The reigning European champions Real have a long-standing relationship with the Guangdong province club, to help develop players. Alibaba is also now working with Madrid to run its online store in China, a relationship it also has with German club Bayern. Over towards the left of the visualisation, there is an interesting array of relationships with the likes of CSM. Together with CSM, Alibaba will develop and run sports properties, which in turn will lead to the creation of mass participation events in China designed to foster the growth of grassroots and amateur sport. Given the nation’s sporting goals, this would appear to be an astute acquisition given CSM’s work with the clients such as US Club Soccer. The latter has 500,000+ members, from which Alibaba may be able to learn a great deal which is of relevance for soccer in China. It is, however, the centre of the visualisation to which one’s attention is drawn, with Alisports and Le Sports clearly being important nodes in the overall network. Two years ago, the network would have looked very different, as Alisports and Le Sports were not actually formed until 2015 and 2014 respectively. Yet very quickly, through massive inward investments and ambitious external growth strategies, both companies have rapidly ascended to become important members of the domestic Chinese and global sports landscapes. In 2015, Alisports’ website was a hollow shell that left one asking ‘what does it do and where is the business going to come from?’ A naïve question perhaps, as the company has rapidly become active in boxing, basketball, American football and more. Interestingly, while some of its Chinese industrial counterparts have become embroiled in a headlong dash to acquire soccer properties, Alisports appears to have gone in a different direction, contributing to China’s broader sporting goals. No less intriguing, though apparently very different from its connections with Alisports, is Alibaba’s relationship with Le Sports. As the visualisation shows, this brings the company into direct contact with Wanda, which was set-up and is owned by Jack Ma’s Chinese corporate rival Wang Jianlin. Unsubstantiated rumours have circulated that the two of them have a somewhat fractious relationship; whether or not this is true, Ma and Wang have routinely traded places over recent years as China’s richest man. The connection of China’s two mightiest corporations came about in early 2016 when both of their founders helped pump US$1.23 billion into Le Sports – Wang through Wanda, and Ma via his Yunfeng Capital investment vehicle. This has enabled the two to further build their own networks, as Le Sports has a diverse array of established relationships with the likes of the United States’ National Basketball Association (for which Le Sports serves as NBA China’s official smart TV and over-the-top broadcast partner) and boxer Manny Pacquiao (who will work with the company to open 400 Pacquiao-branded boxing clubs in China). ‘Open sesame’ indeed: the connectedness of Chinese sport and its embeddedness in the principles of guanxi never ceases to amaze. Alibaba’s IOC deal marks yet another marriage in the development of his corporation’s sports portfolio. There is treasure in the sports network, and Jack Ma knows it. Next Sporting Director: Football’s most misunderstood job?